This past week at work, a colleague shared a story of how her Grandmother recently gave her on her thirtieth birthday a piece of jewelry from her own Grandmother stored in a special box from her Great-Grandmother. My colleague was very proud that her Grandmother, now in her late eighties, had chosen to wait until this very birthday to pass along the string of pearls and the pretty box, two items her Grandmother had cherished for much of a lifetime. My own Grandmother gave me a ring when I thirteen that had been given to her by her own Grandmother. It was a special ring for her and she gave it to me as a I graduated from grade school and was about to set off on my high school adventure. Just like my friend’s Grandma, who encouraged her to keep special care of the pearls and the box, my Grandmother asked me to store it in a safe place. Of course, these warnings seemed a bit unnecessary as nothing but pride crossed my mind upon receiving this special gift from my Grandmother. I knew I had been entrusted with something special, and it was my honor and obligation to keep it safe. Recently I showed my own five year daughter my ring and told her the story of how I received it from my Grandmother. I told her someday that ring might be hers, and she said that would be neat to receive a special gift one day from me, perhaps even my Grandma’s ring. With every gift or memento passed down through the generations, stories are shared, memories are prolonged and traditions are passed. 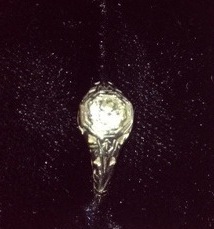 Every time I see the ring I remember my Grandmother and the pride and pleasure I had when I received her special gift. What special gift have you received that was passed down through the generations? What have you yourself passed down?